Two muscular gay men were behind us in the queue for The Coconut Club at Ann Siang Hill. This was their first meet-up; they were awkward with each other and asked introductory questions like “Can you speak Chinese [sic]?” They probably got to know each other on Grindr. They were over-achievers. One was from KL and had a PhD from a UK university. The other was a Filipino Chinese who used to work in New York. That’s why this hipster restaurant has a different clientele from most hipster cafes. In most hipster cafes, the patrons are teenagers or in their 20s, but here, most patrons are middle aged or elderly. The menu is small. Besides nasi lemak ($12.80), there are fried fish (market price), otah ($8.50), and fried egg ($1.50). There is also a “secret” menu which the servers inform everyone. On the day we were there, the secret menu consisted of sambal la-la, tempe, and lady’s fingers. -they import Mawa coconuts from Sabak Bernam, Selangor, three times a week, and they cold-press them to coconut milk. So how is the nasi lemak? It is comparable to International Muslim Food Stall (IMFS), the best nasi lemak in Singapore. IMFS has better rice and better sambal. Coconut Club’s rice is not lemak, not coconuty enough, and the sambal is sweet, not spicy, and isn’t fragrant enough. But Coconut Club is better for its fried chicken. Their ayam goreng berempah is marinated with ginger, turmeric, galangal, and lemongrass. The meat is soooo tender and the marinade has permeated into the flesh. The shreds of marinade remain on the skin, giving it extra texture. This may be the best fried chicken in Singapore. So shiok! One thing they can improve on their nasi lemak is their egg. 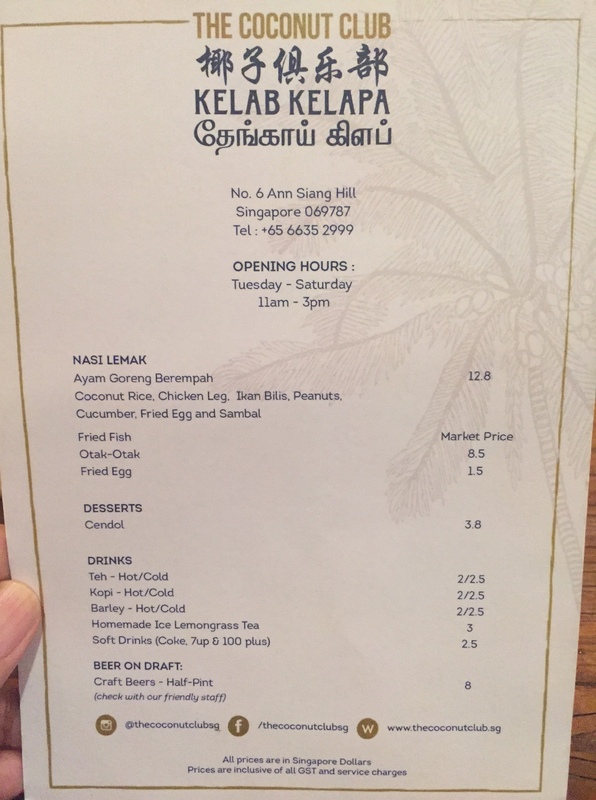 They take care of the ingredients in the nasi lemak but the egg is carelessly cooked. It’s like they aim to score A*, but they don’t want to get full marks. When the sambal for nasi lemak isn’t spicy enough, the sambal lala ($10.80) is fiery. Except for one or two unopened molluscs, this dish is good. Nothing amiss. We LOVE the chendol ($3.80). This is how traditional chendol is supposed to be: just shaved ice, thick coconut milk, gula melaka, and the green “worms.” The simplicity enhances the elegance of it. To the gay Filipino expat who brought his date here, The Coconut Club is an eat-and-go joint, not ideal for first dates. But the food is good. We paid $43 for two persons. Considering we usually pay $55 for Old Town or Papparich, this is very good value at CBD area. Definitely worth coming here if you don’t mind queuing. Photo Credit: Photo of politicians taken from Vivian Balakrishnan’s facebook.